In a Friday night surprise, the Federal Energy Regulatory Commission voted 2-1 to approve the $5.5 billion Atlantic Coast Pipeline, 160 miles of which will run through eastern North Carolina. However, the project still has yet to receive its required state permits and it is likely to face legal challenges from environmental advocates. The 159-page order, which included an extensive dissent from Commissioner Cheryl LaFleur, contains many puzzling if not contradictory conclusions. The decision acknowledged “the project will result in some adverse and significant environmental impacts,” including to the detriment of more than 100 endangered, threatened or at-risk species over the entire 600-mile route, “but that these impacts will be reduced to acceptable levels,” as long as contractors meet the 73 conditions — which are not enforceable — as laid out in the ruling. In North Carolina, state regulators and environmental groups are concerned about the project’s effect on wetlands and waterways, particularly the Neuse River. Atlantic Coast Pipeline LLC, which is primarily owned by Dominion Energy and Duke Energy, plan to use an invasive method of installing the pipeline across the river, called a cofferdam. To put it in human medical terms, a cofferdam is like having an open incision rather than laparoscopic surgery. 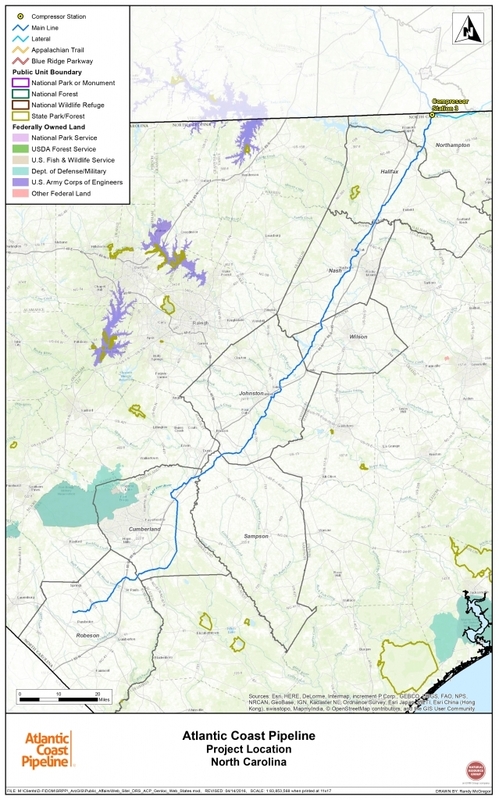 An example of cyclical reasoning is FERC’s contention that ACP, LLC is new to the pipeline marketplace “with no existing customers.” While the ACP is Duke and Dominion’s first foray into the pipeline world, these utilities do have existing customers — their electric ratepayers, who will foot the bill for the project, plus the 14 percent rate of return. The details of how those purported benefits, particularly regarding renewable energy will be realized is unclear. Opponents have argued that natural gas can be shipped via existing pipelines, and that the additional supply is not needed. Duke and Dominion have countered that 96 percent of the natural gas is spoken for. However, these are not outside parties — industry, for example — clamoring for natural gas, but the utilities themselves. FERC acknowledged that five of the six “shippers,” as they are known, are affiliated with the utilities. But FERC determined that the incestuous relationship doesn’t require the commission to examine the agreements to evaluate the need for the project. FERC also denied commenters’ requests for an evidentiary trial-type hearing on the project, saying that the issues “have been adequately argued, and a determination can be made on the basis of the existing record in this proceeding.” This is likely a response to repeated protests at its hearings. FERC has enacted rules to keep demonstrators at bay; it also has sequestered commenters from the media while making their statements. Commissioner LaFleur argued against approving the ACP, in part because another project, the Mountain Valley Pipeline, is proposed to be built in the same region with certain segments close by. She encouraged the systems to merge, an alternative FERC had already dismissed because of the time needed to develop a revised proposal. “I acknowledge that if the applicants were to adopt an alternative solution, it would require considerable additional work and time. However, the decision before the Commission is simply whether to approve or reject these projects, which will be in place for decades. Given the environmental impacts and possible superior alternatives, approving these two pipeline projects on this record is not a decision I can support,” she wrote. The NC Department of Environmental Quality could theoretically stop the pipeline by refusing to issue certain permits, but given FERC’s ruling, it’s unlikely. FERC specifically said that any state or local permits “must be consistent with the federal order” — presumably no more lenient or stringent. Nor can state or local governments stall the project. “State and local agencies, through application of state or local laws, may not prohibit or unreasonably delay the construction or operation of facilities approved by this Commission,” the ruling reads. This statement is in response to states’ hesitance to approve permits for the project. West Virginia has rescinded its previous 401 certification for the ACP; Virginia will not hold public hearings before the state Water Board before December. And NC DEQ’s Division of Water Resources delayed its decision on approving ACP’s water quality and buffer application because of incomplete and missing information. ACP has since provided that information, and the division has until Nov. 28 to issue its decision. Meanwhile, the state’s Division of Energy, Mineral and Land Resources rejected the ACP’s erosion and sedimentation plan for being inadequate. The ACP has until mid-November to resubmit that plan. The state is also accepting public comment and holding a public hearing on the project’s air quality permit for a compressor station in Northampton County. The hearing is scheduled for Nov. 15 at Garysburg Town Hall, 504 Old Highway Road, Garysburg, N.C., 27831. Speaker registration will begin at 5 p.m.
Duke and Dominion appeared to be concerned about the possibility the project could lose momentum. Last month, the utilities asked FERC to fast track its decision and rule on the proposal in September. Around the same time, Duke and Dominion announced a pollinator project, promising to plant new habitats for butterflies and bees on up to 750 acres along the route. The timing of the decision coincides with other key rulings, both state and federal. Just last week, the legislature overrode Gov. Cooper’s veto of Senate Bill 16. Now law, it allows out of state companies, such as Dominion, to use eminent domain to secure private land, up to 100 feet wide, for pipelines. And on a federal level, President Trump signed an executive order last week to rescind the Clean Power Plan. The CPP requires that by 2030, the power sector will reduce its carbon dioxide emissions 32 percent below their 2005 levels, according to the Environmental Protection Agency. Those reductions would presumably come from the phase-out of coal-fired power plants and the switch to natural gas or renewable energy. However, removing these regulations won’t necessarily revive the coal industry, which is less profitable than other energy sources. The utilities fail to mention that the ACP itself will destroy vital habitats. Nor does it discuss any herbicides that would be necessary to keep the rights-of-way accessible and clear of unwanted plants. And a federal district court in the District of Columbia ruled last month that FERC did not adequately consider the effects of methane on climate change when it approved a Southeast Markets pipeline. The Sierra Club had sued, alleging several points, including the pipeline’s release of greenhouse gases. FERC now must reconsider the project. It is Cooper’s DEQ that will approve this – and they will. Duke and Cooper are very close. Dominion Energy is on record saying that the Atlantic Coast Pipeline will be extended to South Carolina. This means what has been proposed doesn’t reflect the full scope of impacts. The number of compressor stations will need to increase. The compressor station that was proposed in NC is undersized, and will need to be expanded. The Mountain Valley Pipeline and the Atlantic Coast Pipeline are both boondoggles that will have mind-boggling impacts on the environment and will be costly for ratepayers. Customers want clean, renewable energy such as solar and wind. Our atmosphere does not need more methane or CO2 emissions adding to our pollution burden.